Hello and welcome! Today I'm hopping along with the team from A Blog Named Hero, as well as the Hero Arts creative team, to share a little Hero Arts holiday love! You should have arrived here by way of Linda Trace. If not, hop over to the Hero Arts blog and join us from the very beginning! I layered a bunch of different products to create my background. 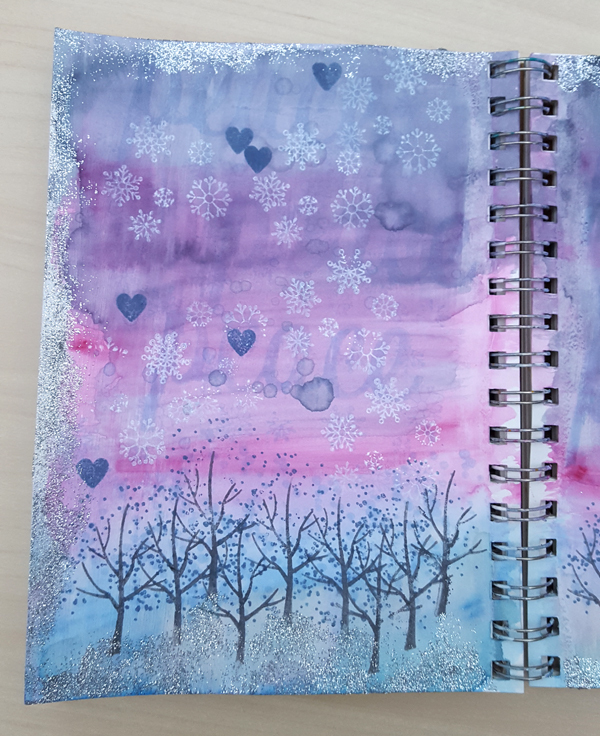 I added Snowflakes by Lia in both Soft Sky and Unicorn White inks. The woodblock stamp Peace is also stamped in Soft Sky. And there are few hearts from Build a Wreath by Lia stamped in Stone Wash floating around in the sky. The bottom of the pages were stamped with Color Layering Fall Trees. I was inspired by this gorgeous card on the Hero Arts blog, created by sweet Clare Prezzia. I just love these trees in blue! I used the same Soft Sky and Stone Wash as above, and used the gray from Kelly's Urban Inks for the trunks. The Eiffel Tower is a Hero Arts cut file found in the Silhouette Store, which I cut out on gray paper and coated with the absolutely fabulous Bo Bunny Glitter Paste. I used silver here, but I also have it in "sugar" - I am loving this stuff!! I used my fingertip to spread it around the edges of my pages as well. Finally, I added some stickers from my stash for the "may there be peace" message. Alrighty, it's time to keep hopping! From here, please head over and visit my friend Lisa Stein! And be sure to add comments to every blog you visit, as Hero Arts is giving away three of the November My Monthly Hero kits to three lucky commenters, pulled from all of the comments across this entire hop! What a beautiful art journal spread! Libby, this is absolutely wonderful. BEAUTIFUL pages Libby - LOVE the colours and design!!! This tragedy has touched everyone, all over the world, my heart breaks thinking what people can do to each other and I join you in saying "may there be peace"!!! Such a Peaceful creation in Blue! Wonderful watercolor effect and designing, love the shimmery Paris! this is so beautiful, Libby! I love the glitter and the pretty colors - I'm so honored you liked my card that much! This is a touching tribute to poor Paris. I love this. J'aime Paris. What a gorgeous journal page! This is a very good journal page and I love the colors. And may we find peace. Beautiful pages Libby and sweet tribute to our French friends! Beautiful journal page,just right for today. Lovely colors. Great winter scene. 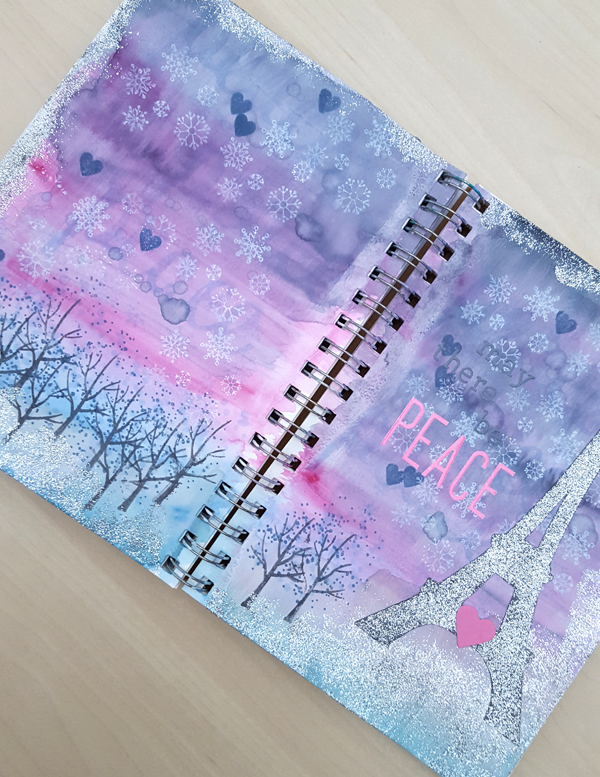 Libby what a beautiful art journal peace with beautiful colors and perfect sentiment! The added glitter is the perfect detail. I am also still in shock here. Your page is beautiful, hope that the Eiffel Tower will shine again soon, as the glittering one you created. Oh this is one beautiful art journal dedicated to the people in Paris. Your are very talented and creative. The background is stunning! I love all the beautiful colors you have for your journal pages. Especially the pops of sparkly silver! Such a lovely tribute to Paris, Libby! The colors and glitter are stunning! Makes me want to start an art journal too - it's very inspiring! Libby! So pretty. Makes me want an art journal. And better watercolors. AND glitter paste. You're an excellent enabler. Great page. Love the BoBunny Glitter paste! Such an ethereal effect the way you applied around the edges. And with just your fingers! I must get some. This is so very pretty. I have never seen or heard of the glitter paste, so I need to check that out. Beautiful journal pages!! It's wonderful to have an artistic outlet to express your feelings!! A timely journal page. Quietly acknowledging tragedy and hoping for a better future. Beautiful pages!! Love the colors.. Lovely snowflakes!! It's a nice way to express!! Libby, this is just stunning! Beautiful journal page. How inspiring! I love the colors and the meaning. What a nice tribute to the people of France. Love the layout. YEAH WE ALL HOPE FOR PEACE. BEAUTIFUL LAYOUT. FAB COLOURS. Libby, i was adopted and grew up telling everyone that I was French, because I so very much wanted to be. I grew up and found my birth-family, and I AM French! So your post tugged at my heart-strings. Thank you for this lovely tribute to Paris. God bless you. Hi Libby ~ Your post is stunningly beautiful. My sister and her family lived in Paris for 3 years, so it especially hits home in that way (plus I'm a New Yorker with family in NYC!). Your tribute to Paris is lovingly done with each stroke of your brush. Thanks for sharing. Beautiful colors and the Peace sentiment is so appropriate. Such a beautiful creation! I am still in shock over what happened in Paris. Just beautiful. A remarkable tribute, thanks for sharing. 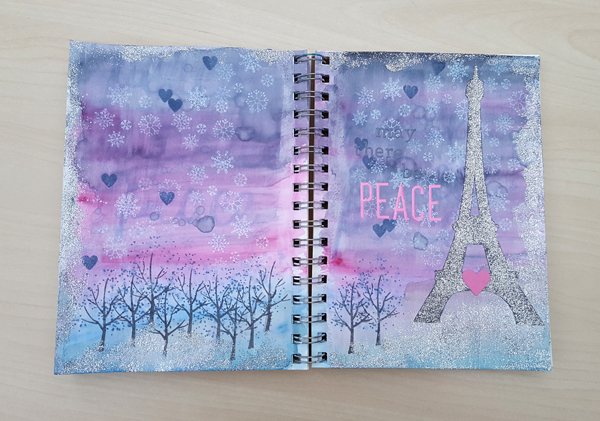 Love the art journal pages, so pretty, and love the Peace sentiment over Paris. Beautiful art and a remarkable, heartfelt expression of our collective emotions regarding this tragedy. Love the colors on your journal page. Just beautiful!! That blue and purple background is awesome! I am inspired to do the same in my journal. thank you! Lovely background and I love the silver edges! Thank you for this lovely card and tribute. This is a beautiful tribute to all of those touched by the tragic and senseless events in Paris. My prayers are with everyone who has been hurt, physically and emotionally. Gorgeous journal page. The colors are dreamy. If all the world painted with love like this, there would be peace. Very touching - love your use of watercolors for this project. What a beautiful and loving response to a horrific act. Thank you for expressing yourself, as well as what so many of us are feeling, so wonderfully! I have to get some of that Bo Bunny Glitter paste, it made your Eiffel Tower pop off the page. Beautiful tribute! Wonderful way to express your feelings, our thoughts and prayers are with the people of Paris. Beautiful journal page. I'm just getting into water colors and I love the colors you used. Wow your journal pages are so pretty!!! Love the gorgeous background. I am from Mumbai and know well the horror of having your city bombed. My heart goes out to the people in Paris. Your sentiment sums it up beautifully; "let there be peace" beautifully soft and inspiring. What lovely tribute pages for the tragedy that Paris is enduring! The watercoloring is beautiful, and I love the design! Thanks so much!! Thank you for sharing this beautiful, glittery page! What a beautiful expression of your feelings! It is impossible to put into words how we feel about such horrific violence, but art speaks in a way that words cannot. Simply beautiful, Libby - your journal pages are serene and heartfelt. A great way to capture the emotions around the tragic events in Paris. Beautiful journal pages, Libby! The watercoloring is just gorgeous! Beautiful colors, design and tribute. Such an appropriate and heartfelt journal page, Libby! My heart goes out to those who were impacted by this horrible event. Love the glittered paste!!! Lovely journal page, love the gorgeous colors. Such a beautiful tribute to Paris. I love your sparkley border all around the page. I am glad to see the Eiffel Tower is still shining! what a lovely way to tribute paris in these tragic events. Very moving journal page. The colors are so soft. Makes you stop and think. Beautiful job. What a beautiful page - I can really feel the emotions from this page. such an awful thing to happen to Paris - to anyone! And I think of the plane full of Russian children that was bombed by ISIS as well - so sad that these evil people think that what they are doing is right somehow. A nice water color background. Such a beautiful page. Like the background. The tree stamps are really cool, like the different ideas for this stamp set. What a great tribute to Paris! You showed your love with the heart. Amazing. Wow, very beautiful! I like how you added so many mixed elements! Libby, your journal page is lovely. And the subject is so appropriate right now. Nice job. Beautiful pages! Love the colors! Love your journal piece with the poignant sentiment! Beautiful, bright art work during a dark time. Beautiful pages. Love the colors. So sad, we are all grieving. So pretty! Love seeing other projects using stamp supplies!!! Love the colors and scenery of your journal pages! Wow, your journal pages are stunning! I love the colors, snowflakes and glitter. Thanks for sharing. 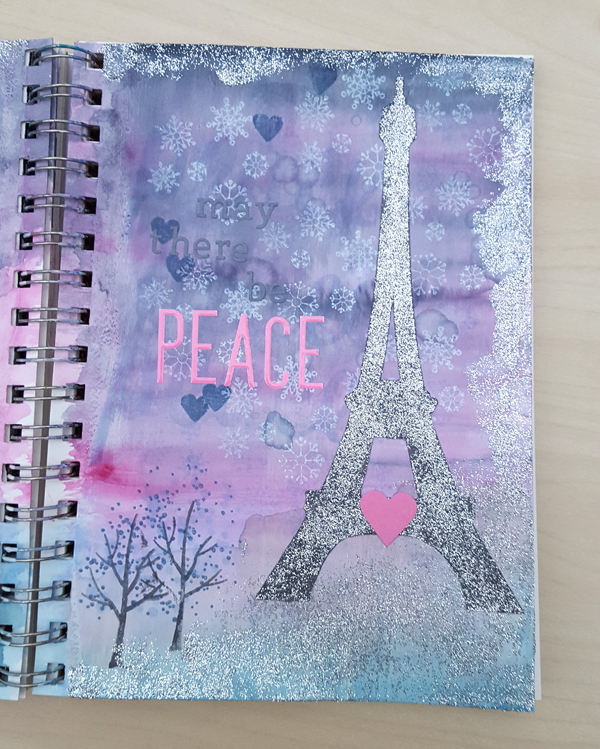 Beautiful journal page; and my heart goes out to all who are effected by the attack on Paris. Very nice journal! I guess that the watercolor ground keeps the watercolors from coming through the back of the page, but so the page is still absorbent. I will have to look into it more. What beautiful journal pages. What a terrible tragedy in Paris, we have been flying the flag at half mast for the last three days at work in solidarity with the French national days of morning. BEAUTIFUL project, and a wonderful way to show your support for Paris! Awesome background. Love the sparkle too. Thanks for sharing. Beautiful pages to honor lives lost in Paris! Beautiful pages and wonderful it is in honor o the Paris tragedy. Thanks for sharing. 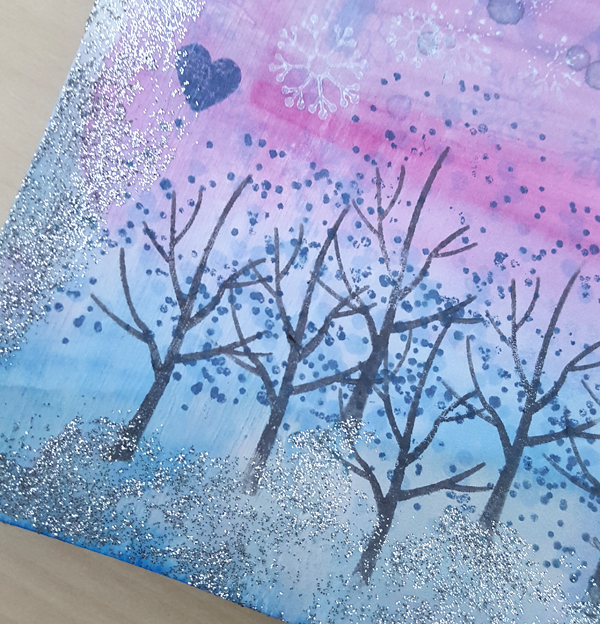 That water color background with the snowflakes and the glitter is out of this world! Your background is so peaceful to my eyes. Love it. Wonderful spread. Love the mix of soft colours with the silver. absolutely beautiful and what a wonderful way to express your feelings. Beautiful page, love those colors.